Emotions are catalyzers for the brain. Emotions let the brain know you are into something important. When something is important for the brain, the brain makes an effort to remember it. There are more neuron connections involved in the brain with emotions than with simple ideas. Let’s see an example about it. You wake up in the morning, take a shower and head to work early in the morning. As you are early this morning, you decide to go to the new coffee shop on your way to work and buy yourself a cup of coffee, as you are leaving, there is this woman talking on the phone entering in the coffee shop. As she is talking she manages to push, instead of pulling it. The door by the way has a huge “pull” sign on it. 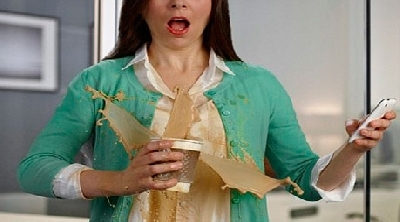 You were leaving and because she pushed the door so fast, you didn’t have a chance to react and the coffee splits all over your white shirt. She was in such a hurry that she didn’t even notice the incident, she enters the shop and heads straight ahead into the counter. You look at her with a silent claim in your eyes, but she doesn’t even notice you. You grab a bunch of napkins and leave the coffee shop. By now it is not early anymore, so you cannot go back to your house and put on another shirt, so you head out to work thinking about all the explanations you will have to tell your co-workers all day long, but specially what you are going to say to the client you will meet this afternoon. I am sure that if by the end of the day I would ask you what dress was the woman that pushes your coffee in the morning, or a description of herself. You wouldn’t need much to give me the detailed description of her, and of course of all the incident in the morning. Perhaps you also would easily remember what you told your client, and what he said back. But If I ask you how much did you pay for the coffee, or where did you leave your car keys when you arrived to your house, or how many emails you answered in the morning, chances are you would have trouble remembering most of those. Not because they were not important, some may, some may not, but the key is that those things did not have an emotion and the coffee incident had. It was also a powerful experience, not because of the consequences, but because it involved an emotion. Most of the things we can’t seem to remember are because there wasn’t an emotion involved. You can’t remember where you put your keys or your cell phone, because you just did it. You have to call your own number to hear where you left it. In first instance that happens because you were not paying attention, probably because you were putting your attention on your thoughts, and not on the action itself. This happens to everyone all the time, but what about when she made you spill your coffee, an emotion arises and then you are not only paying attention, but you are also telling your brain to remember that, because it is important. If you would have left the shop a few seconds before, you wold probably may not even notice the person entering the shop, as it happens so many times during your every day activities. That is also the reason because when we get angry or we are worrying for something important, we keep thinking about it, because it is an emotion the one telling the brain to remember it. Problem here is that with every time you remember it in your brain, you experience the same emotion again, with the same chemical experience inside your body, but also every time your brain is making stronger connections in your brain. When you really want to remember something important, you can try to remember it, while you bring a powerful emotion, even if it doesn’t have anything to do with what you are remembering. Emotions are the key to Memory. ← Repressed emotions may manifest as illness.